Ali Wong is one of the many stand-up comedians who is bringing fun into entertainment with performances that yield to refreshingly interesting and top quality shows. The American who also writes pursued her dream of becoming a reputable star in the comedy entertainment world after graduation from college in 2005 and has since earned a vital status. Prior to her enviable fame, she spent time in the Pacific Heights neighborhood of San Fransico, Califonia. She has featured in many comedy series and also known for her Netflix stand-up specials Baby Cobra, and Hard Knock Wife. Ali Wong was born Alexandra Ali Wong on April 19, 1982, to father Adolphus Wong and mother Tam Tammy Wong. She has three siblings and they all grew up under their parents’ care. Her father is of Chinese descent but he was born in America making him an American citizen by birth. Ali Wong’s mother, on the other hand, moved from Vietnam to the United States in 1960. Ali has even spent time in her mother’s family home, the capital of Vietnam, Hanoi during her junior year. Wong attended San Francisco University High School. There, she served as the student body class president for her brilliance. She finished in 2000 and furthered in UCLA (University of Califonia Los Angeles) where she finished with the best distinction. Despite being a lover of school, Wong was passionate about performing. She preferred to be in the spotlight rather than being a professor and thus began performing in school as a member of the University’s LCC Theatre Company which mainly grooms Asian American talents. The theatre is arguably the biggest and longest-running college theater company for Asian-Americans in the United States. In 2005, the year Wong finished college, she did her first stand-up comedy at Brainwash Cafe. After winning many hearts, she realized that her calling was in comedy and as a result, relocated to New York to further pursue that dream. Arriving in New York and focused on just comedy, Wong became quite busy sometimes performing nine times a night. As more and more people noticed and welcomed her comic style she became even more energetic and determined to achieve this dream. Her deep love finally gained her victory and made her a leading light in the local comedy circuit when she was ranked as one of the 10 Comics to Watch by a weekly entertainment magazine Variety. She garnered points for not just being extremely funny but also original. Within six years, the beauty gained more prominence and as her career growth came so fast, she decided to diversify by venturing into acting and her first role was on the Tonight Show appearing on the comedy show Underground. Ali Wong’s toughness also landed her many other roles in different comedy series including NBC shows Are You There, and Chelsea Lately. She also appeared in VH1’s Best Week Ever, and MTV’s Hey Girl in 2013. Wong has also appeared in some films that are not particularly comedy such as Savages, and Black Box. Her other movies include Dealin’ with Idiots, Inside Army Schumer, America Housewife, and Are You There, Chelsea? Beyond acting, Wong has also proven that she is unwavering and multi-tasking by venturing into writing. The comedy-actress has been writing on Fresh Off the Beat since 2014 and wrote the series’ first three seasons. Ali Wong may be pulling strong weight with her amazing comics but she is not pulling enough in terms of height. She is only 5’3″ but who cares? She is loved no doubt and her reputation has grown massively; she keeps winning with her talent. Wong has two children; a boy and a girl. Her daughter was born in 2015 while she welcomed her son in 2018. Apparently, Wong draws inspiration from women who are making noticeable changes in the world as she named her daughter Mari in honor of Maria Kondo, a Japanese Organizing consultant and author, who basically writes books on organizing. Some of Maria’s books have been published in up to 30 countries (USA, Germany, France, Indonesia, etc) with one of them becoming a bestseller in Japan and Europe. The father of her children is also her loving husband named Justin Hakuta. She and Justin fell for each other after their paths crossed at a wedding. Soon after they started dating and got hitched in 2014. Justin Hakuta is a well-educated businessman and not an actor or entertainer. He has had some training in Mexico and attended Washington’s Sidwell Friends School. He also obtained Bachelor’s degree from Carnegie Mellon University and an MBA from Harvard. For his competency in the business world, Justin has taken up different responsibilities in firms including Cargomatic Inc, GoodRx, etc. While he is not in the spotlight as an actor or entertainer, Wong is not the only entertainer he has known in his life. His father Ken Hakuta, a Japanese is widely known as Dr. Fad ruled the industry in the 80’s as an inventor and TV personality. Those days, he anchored the kid’s show Dr. Fad show which was about science and inventions. The show’s main goal was to encourage children’s crafts. As a result of the success of the show and the positive impact it had on the kids, he was recognized by an Institute in Philadelphia as the inventor of the year. Justin’s mother is a Filipino. She and his dad got married in 1977 after they met as colleagues while working in World Bank. Justin has two siblings named Kenzo and Aki. 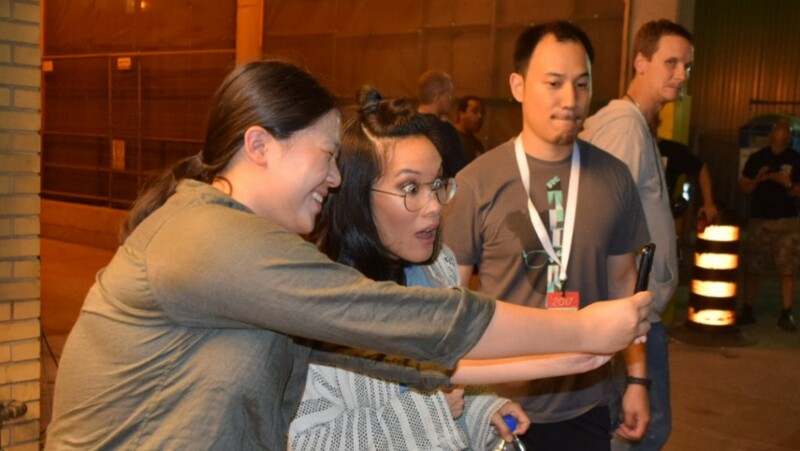 Both Justin and her wife Ali Wong hardly share personal things on social media besides their career, how they’ve been able to build their relationship and photos of their family time. Thus, the real amount which Ali’s hard work has earned her since she entered the industry can’t be verified. However, some sources speculate that the comedian’s net worth is between $1.2 million and $2 million. Whatever it is, her career has been successful and we are certain that Ali Wong’s toughness in her career must be bringing in amounts that commensurate with the efforts she puts.